Under the rule of President Recep Tayyip Erdogan (right) and Prime Minister Ahmet Davutoglu (left), Turkish police and courts have systematically intimidated the media. On November 1, nearly half the Turks (49.4 percent) gave President Recep Tayyip Erdogan and his Islamist government a ballot box license to strangle the other half. He will be only too happy to use that license aggressively. Only five years ago, Turkey was being universally (and wrongly) portrayed as a success story, bringing together conservative Islam and democracy. Today, Turkey boasts one of the worst records of human rights and civil liberties -- including abuses of media freedom -- among countries tied by some kind of bond to Western institutions such as NATO and the European Union (EU). Erdogan hates pluralism. He embraces simple majoritarianism -- so long as he wins the biggest share of the vote. The renewed vote of confidence by pro-Erdogan Turks for Erdogan and the ruling Justice and Development Party (AKP), which he founded in 2001, could be disastrous for millions of anti-Erdogan Turks. In Erdogan's mindset, his party's landslide election victory not only gives him a mandate to rule, but also to crush "the other." In Erdogan's mind, electoral victory gives him a mandate not only to rule, but also to crush the "other." Unsurprisingly, the West is worried. Only two days after the Turkish elections, State Department Spokeswoman Elizabeth Trudeau spoke of concerns about media freedoms in Turkey, and urged the country to uphold universal democratic values. "The media outlets and individual journalists critical of the government were subject to pressure and intimidation during the campaign, seemingly in a manner calculated to weaken political opposition," Trudeau said. "We urge Turkish authorities to ensure their actions uphold the universal democratic values enshrined in Turkey's constitution." Across the Atlantic, the EU Commissioner for Enlargement and European Neighbourhood Policy warned the Turkish government that continued threats to media freedom, including "intimidation" of journalists, will undercut Turkey's -- already crawling -- bid to join the EU. The systematic intimidation of the critical press, usually through police operations and/or court verdicts, had reached a peak even before the elections. On October 26, the chief public prosecutor's office in Ankara ordered one such media group, Koza-Ipek, to be placed under the management of a panel of trustees -- all pro-government managers. Without a court order, the government stole two newspapers and two TV stations from the dissident Koza-Ipek group, which it claims is linked with a terrorist organization allegedly run by the U.S.-based Islamic preacher Fethullah Gulen. Gulen was Erdogan's best political ally until 2013, when they had a falling out. The prosecutor appointed pro-government trustees to the management of the Koza-Ipek group, to seize the enterprise. These trustees immediately reversed the editorial policy of the media outlets into a fiercely pro-government line. A few days later, 58 employees at the dailies Bugün and Millet and the broadcasters Bugün TV and Kanaltürk were fired. Only two days after the November 1 election, an Istanbul court ordered the confiscation of the latest issue of Nokta magazine, on the grounds that it "incites crime" with its cover, which showed Erdogan's picture with the headline: "Monday, November 2: The Beginning of Turkey's Civil War." This confiscation occurred less than two months after it an earlier edition was confiscated for "insulting the president." The magazine's editor-in-chief and news editor were arrested. 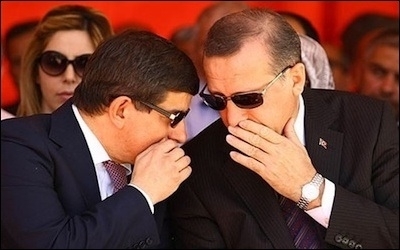 Davutoglu wants to clean up Turkey's image, not by reforming but by hiring a PR firm. Reporters Without Borders, a media freedoms advocacy group, issued a total of seven reports under the title "Timeline of Media Censorship in Turkey" between Sept. 7 and Nov. 3. It is anybody's guess which media group will be the next target. Meanwhile, Erdogan's ally, Prime Minister Ahmet Davutoglu, wants to clean up Turkey's worsening image in the West. But he does not want to do that by upholding universal values, protecting civil liberties and media freedoms and respecting pluralism. He wants to do that by hiring a western public relations firm. Apparently, Davutoglu, who once called Israel a "geopolitical tumor," hired one of the world's largest PR agencies, the U.S.-based Burson-Marsteller (with offices in Washington DC, Berlin, London and Paris) to improve his and his country's "overseas image." Last year, Burson-Marsteller rejected Israel as a client, deeming the Jewish State too controversial. Yet it represented the Muslim Brotherhood of Tunisia. According to Ronn Torossian, a U.S. public relations specialist, "The first job of this legendary public relations agency may be to spin his [Davutoglu's] idea that jihad should not be confused with terrorism. Davutoglu has said there is no connection between jihad and terrorism..."
80% of minority Turks say they cannot openly express themselves on social media. Davutoglu is trying to buy international respect. He cannot. One can earn respect. He cannot expect the civilized parts of the world just to ignore the fact that he is the prime minister of a country where minorities cannot even express themselves. A recent study conducted by a minority organization and funded by the EU found that 80 percent of minorities in Turkey cannot openly express themselves on social media; and a good 35 percent say they are subject to hate speech on the same platform. Erdogan too, is wrong about "respect." After his party's election victory, he spoke of the "Western media" and complained that "they still have not learned to respect who was elected as president with 52% of the people's vote." Erdogan cannot buy respect or force others to respect him. He can only earn respect – something he clearly has no intention of doing. Burak Bekdil is an Ankara-based columnist for the Turkish daily Hürriyet and a fellow at the Middle East Forum.